1500 B.C. to 1760 A.D. The area around present-day Presidio is thought to be the oldest continuously cultivated area in the United States. Evidence shows that the land has been farmed since 1500 B.C. The first Spaniard to visit the area was Cabeza de Vaca in 1553 when it became a stop on the shipwrecked sailor's famous tour. He named it La Junta de las Cruces and it wasn't until late 1582 when the second Spanish visitor arrived. Antonio de Espejo and company renamed the site San Juan Evangelista. In 1681 the area was known as La Junta de los Ríos or juncture of the rivers since it is where the Río Conchos and the Rio Grande merge. In the 1760 the site was home to a penal colony with a garrison of 60 guards. 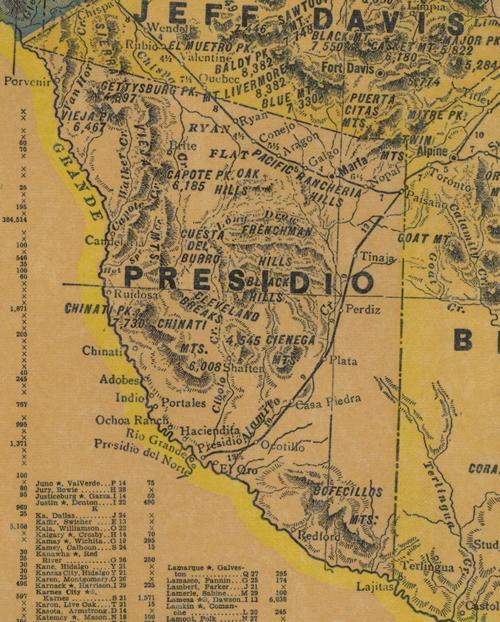 In 1830 the name of the area around Presidio was changed from La Junta de los Rios to Presidio del Norte. Anglo settlers arrived after the Mexican War and settler John Spencer started a horse ranch near Presidio on the US side of the river. The area was subject to violent Indian attacks prior to the Civil War and it wasn't until 1868 when the tiny community received a post office. 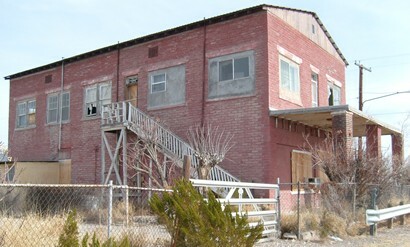 The first public school opened in 1887 but it wasn't until 1930 when the Kansas City, Mexico and Orient Railway arrived at the border town. From a miniscule population of around 100 in 1930, Presidio slowly grew to 1,600 in the late 1980s. Due to an amnesty in 1988, Presidio experienced a boom. The 2010 population stood at 4,426. Presidio is on Hwy 170 way out past Big Bend. A large school with lots of children. I was thirteen, and my sister was 11-12 years old. The town had a drugstore, with a pharmacist, a large café and several businesses. We took picnics to the Rio Grande River on Saturdays to swim, play and have good time. A family named Fenny raised pigs. They kept them in adobe ruins, fed and water them. For their living, the Fenny family would sell the pigs fattened up after they fattened them up. One December day, snow fell on Presidio, Texas. It was very unusual. Everyone came outside to touch it. It seemed no one owned a coat and I thought it was strange. But, when the snow melted quickly, I understood better. Who needs a coat in the “Big Bend”? Also, I remember the pharmacist who sent penicillin out to my mother for a serious burn. It was new then. He said, “I hope this medicine helps her.” It healed her and she went in person to thank him for his help. 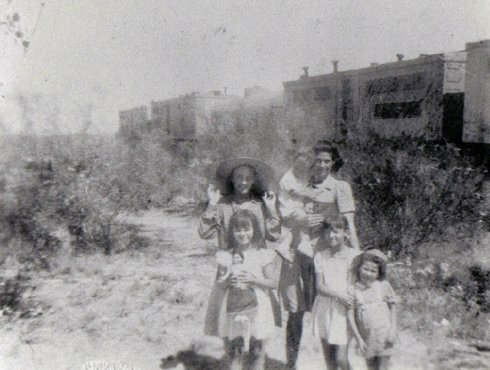 Good folks lived in the Big Bend area. 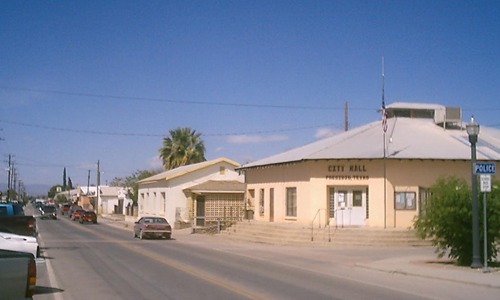 The Oldest Town in Texas? 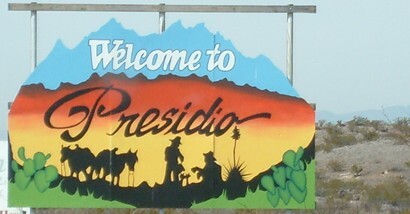 While it recently observed only its twentieth anniversary as a municipality, Presidio claims it was first inhabited about 1200 A.D., more than 500 years before the Declaration of Independence, and was founded in 1683 when Jesuit priests from El Paso established a number of missions in the area, an event commemorated by Presidio’s Santa Teresa de Jesus Catholic Church each fall. Even Presidio’s claim is a little weak. Archeologists say details of the region’s archeology remains spotty. “We’ve worked on this thing for years, and we’re still not able to work out who was where at what time,” admitted Bob Mullouf, director of the Center for Big Bend Studies at Sul Ross State University.